The Nashua Garden Club will hold its March program, Wed. March 6th at 7 PM at the First Baptist Church, 121 Manchester Street, Nashua. The program, Epimediums, Jewels of the Shade will be presented by Karen Perkins, proprietor of Garden Vision Epimediums, the Massachusetts based mail order nursery, started by the renowned Darrell Probst which now offers over 170 species and varieties of Epimediums along with other choice companion shade perennials. Ms. Perkins holds a B.S. in Floriculture and Ornamental Horticulture from Cornell University and an M.S. in Public Garden Management from the University of Delaware. She has worked at many botanic gardens around the United States and the U.K. including the Cornell Plantations, Longwood Gardens, the Arboretum at Flagstaff and the Royal Botanic Gardens in Kew, England and Edinburgh, Scotland. 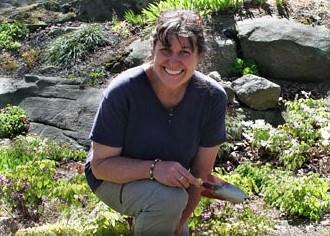 Eager to share her knowledge and assist others, Ms. Perkins also served in the Education Department of the Tower Hill Botanic Garden in Boylston, Massachusetts for 17 years. Expand your shade and semi-shade gardens by learning about Epimediums. These tough plants are easy to grow, long-lived perennials that thrive in the soils of our region and frequently can tolerate dry shady garden sites where other plants have failed. Please join club members for this enlightening program, pleasant conversation and light refreshments. I think Epimediums are very under represented in the garden and strongly encourage everybody to make the trip . I use them extensively in my gardens and can’t imagine gardening without them. I wish I was there and I would go. We are still in Arizona and it is warm and sunny.